Someone asked about measuring oven temperature. That's great for seeing how well an oven does as far as getting to a certain temperature. However, just because an oven can be guaranteed to achieve a certain maximum temperature, doesn't mean it stays at that temperature. 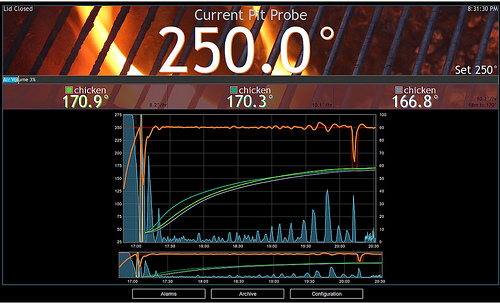 Is there a probe that can handle oven temperatures (lets assume 600 degrees, ignore broiler temperatures) that can send temperature data to a computer while in the oven? I basically want to graph temperature over time. Also, are there know acceptable fluctuations of temperature? Logging the data using a temperature datalogger with a thermocouple interface so it can later be downloaded to a PC. That might be good if getting your laptop / PC near the oven is a hassle. A dedicated USB to thermocouple interface. Using a multimeter with a USB interface and a thermocouple interface. That might have a bit of a learning curve to setup but might be useful if you see yourself ever using the other functions of a multimeter. Thermocouples come in several types (type J, K, T etc) but the main thing to check is that the datalogger you select is compatible with the thermocouple, that they have similar connector types so it's easy to setup and the thermocouple covers an appropriate temperature range. Another thing to be aware of is that some thermocouple sensors (mostly described as probes) are only designed to be inserted into hot substances, the cables attaching them aren't rated for the same high temperature but you can check with the supplier if unsure and it's not mentioned in the specifications. Also I'm not sure of the food safety of thermocouples so I wouldn't use them for measuring the internal temperature of meat without checking into that side of things, but it sounds like that won't be an issue for you. There is a HeterMeter project on github that will do exactly what you want. It contains a webserver that allows you to access it from computers and mobile devices via a web browser anywhere on your local wifi (or even the Internet if you configure your home router to allow it). It can be built to use either a thermocouple or thermistor as the pit probe. The thermocouple components are SMD and can be challenging for a novice to solder. I believe the developer does sell kits with the SMD components pre-soldered, for a fee. I am not the developer. But, I did build one and am quite happy with mine. It was designed for the purpose controlling a charcoal smoker. It allows for 3 food temperature probes + 1 pit probe. The pit probe can be a thermocouple, if you build it that way. The project is all open source. The most significant costs would be a Raspberry Pi (about $35) and the probes (about $15+). By the time you get all of your components, pay shipping and all, you might expect to have $150 or so in the project. Here's a screenshot of one of my cooks using the HeaterMeter. If home built projects are not your thing and you can live without the graphing, consider buying a Maverick temperature probe and just watch it. I had an oven guy here not too long ago to test this exact thing with my oven. Perhaps this being Silicon Valley, he was was an extremely knowledgeable and highly technical fellow. I don't know the exact meter he was using, but I believe he used a thermocouple probe that had a special attachment to wrap around the rack at the dead center of the oven. He simply sat there and watched the temperature fluctuations for a period of time, I believe maybe 15-20 minutes, and was then able to see the variance in my oven temp was ± 25 deg F. That is to say, if it was set for 350 F, it would get as hot as 375 F and as cool as 325 F.
I don't know that you need something as involved as a computer logging system for this, but maybe it would be a fun project. To answer the second question, yes, all ovens will have some acceptable range of temperature fluctuation. You can picture it like a sine wave. From what my repairman told me, the better ovens won't fluctuate as much. Not the answer you're looking for? Browse other questions tagged temperature oven or ask your own question.